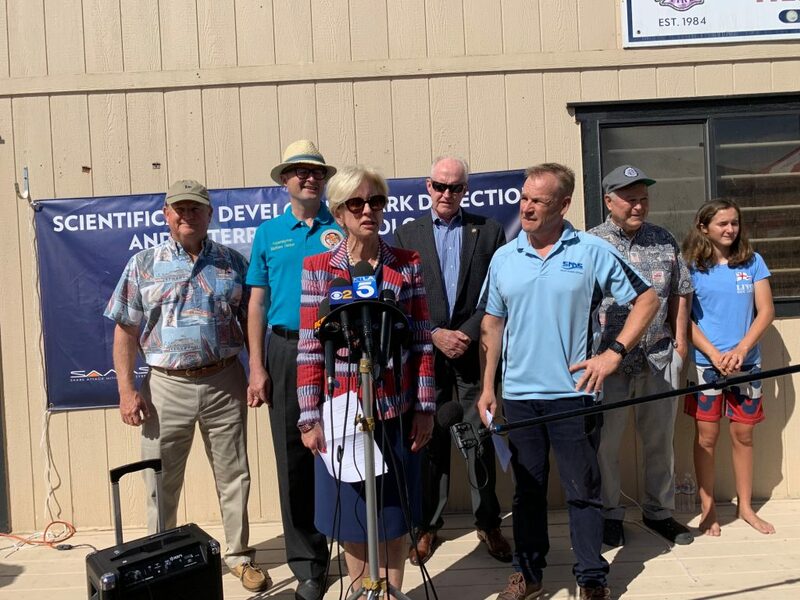 Newport Beach City Councilwoman Diane Dixon speaks at the Clever Buoy shark detection launch event on Wednesday at the Balboa Pier, as (left to right) Mayor Marshall “Duffy” Duffield, Assemblyman Matthew Harper, Councilman Jeff Herdman, Clever Buoy system founder Craig Anderson, Congressman Dana Rohrabacher and his daughter, listen. An advanced shark detection system was launched in Newport Beach this week. 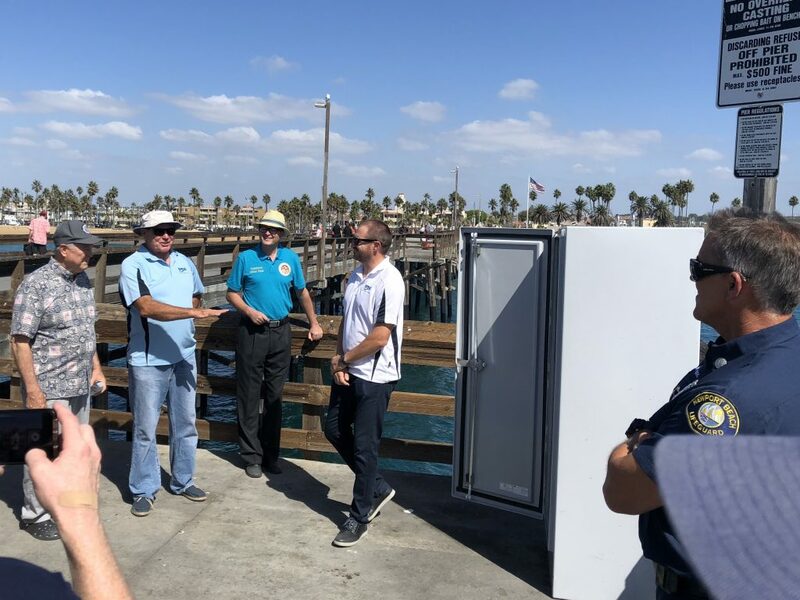 The city and Smart Marine Systems hosted an event Wednesday at the Balboa Pier to kick off a two-month pilot program of the Clever Buoy system, which will monitor marine life off the coast. 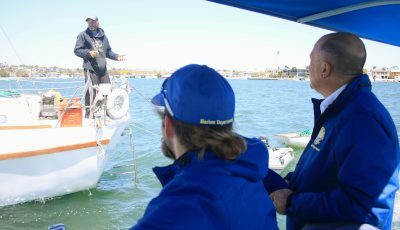 The program was developed to specifically identify sharks, explained Clever Buoy system founder, Craig Anderson. 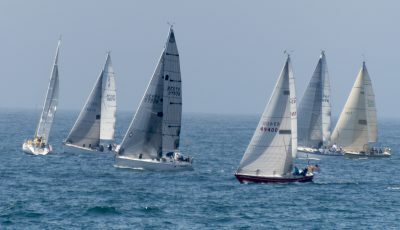 At Tuesday’s City Council meeting, Councilwoman Diane Dixon mentioned the pilot project using the “technically advanced” marine operating system. 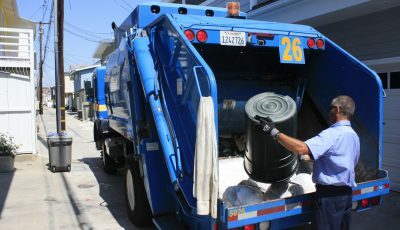 “If this works…This will really be a game changer,” Dixon said. It’s an exciting experiment and it’s really going to be interesting to see the outcome, she commented. 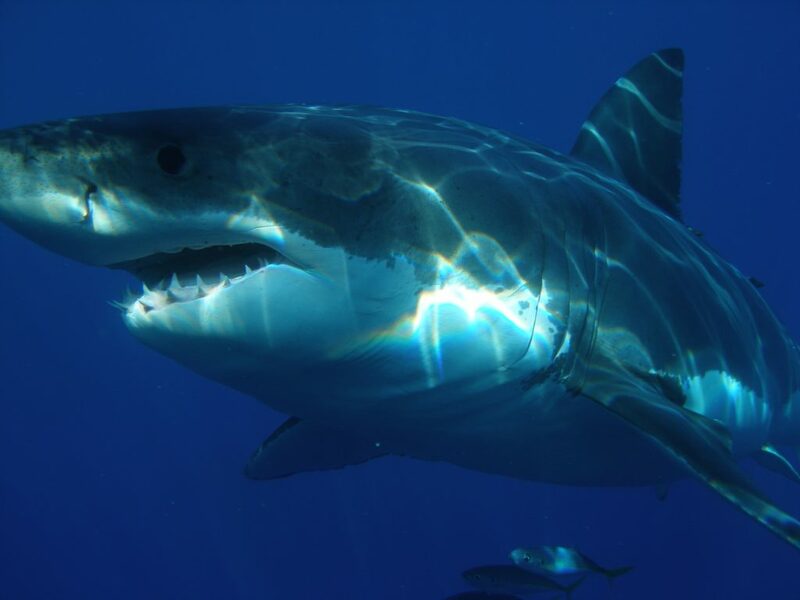 A great white shark, a species sometimes found off the coast of Newport Beach. There is no cost to the city, Dixon emphasized. The company is donating it to prove its efficacy, she explained. 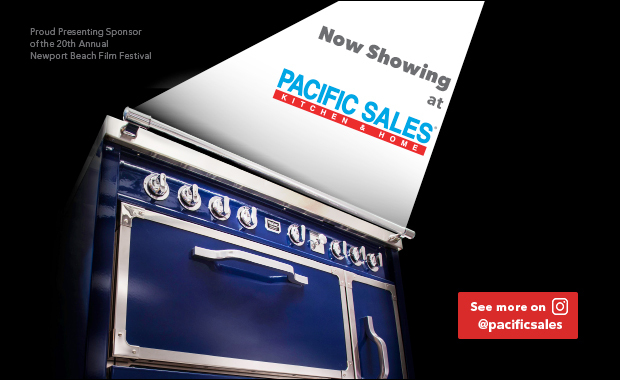 The buy system is located about 250 feet off the Balboa Pier. This is the first time this type of system has been use in the U.S.
Anderson explained how the system works at Tuesday’s event. As soon as the system detects an object of a certain size, the software analyzes a swim pattern and decides on a level of probability if it exhibiting shark-like swim patterns. The program, by identifying sharks in the water, is being “prudent and proactive” about keeping people safe, said Maria Korcsmaros, who survived a shark attack off of Corona del Mar in 2016. Anderson hopes their shark monitoring software will follow a similar path to facial recognition. Looking back 15 years ago, when facial recognition software first hit the streets, it could simply tell the difference between a human and a dog, he explained, and now it can find a single person walking down the street. At this point they are only focusing on locating and identifying sharks, Anderson said. 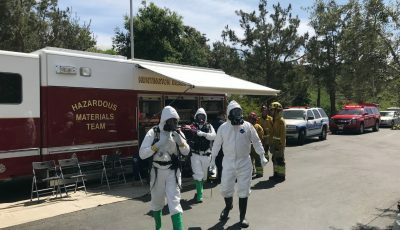 “Obviously they are a great threat, not only to beach safety, but also beach communities and beach businesses and the following impact,” he noted. 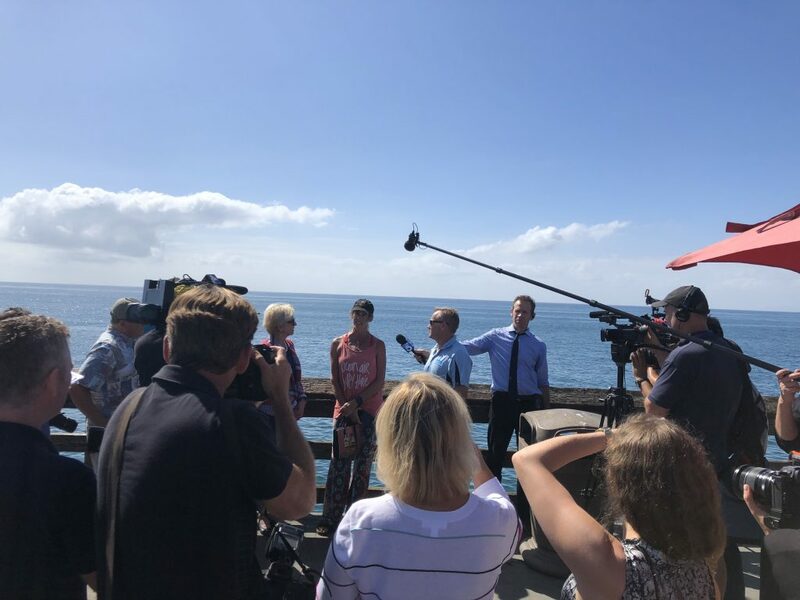 Media and other press conference attendees gather as City Councilwoman Diane Dixon and and Smart Media Systems co-founder Craig Anderson listen to shark attack survivor Maria Korcsmaros on Wednesday at the end of the Balboa Pier. (left to right) Congressman Dana Rohrabacher, Ian Cairns (former pro surfer and representative of Smart Marine Systems), Assemblyman Matthew Harper and Smart Marine Systems technical manager Richard Talmage, talk about the Clever Buoy shark detection system near an equipment cabinet at the end of Balboa Pier.